We've moved back to Philadelphia! Arnold Palmer, American Pro Golfer holding a custom Itz A Stitch belt on his birthday. 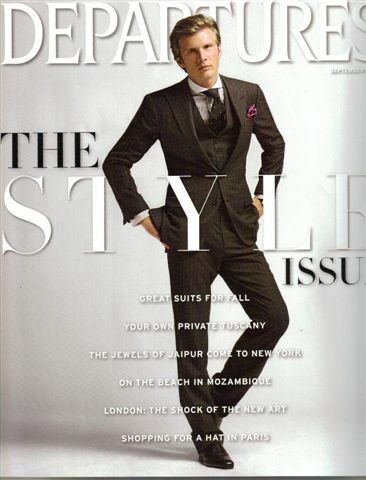 Itz A Stitch and Hickey Freeman were featured in the September 2008 Style Guide for Departures Magazine. 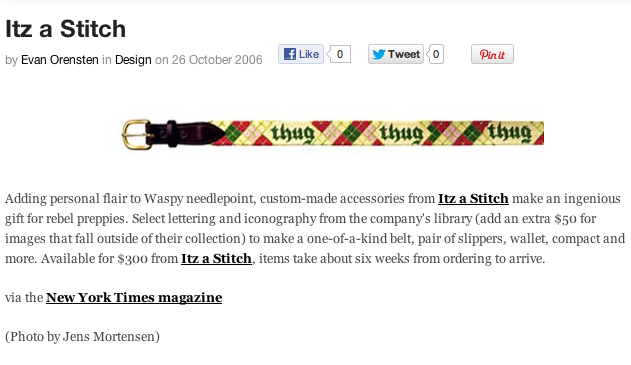 The blog Cool Hunting featured Itz A Stitch as a follow-up to the New York Times article that also featured Itz A Stitch. 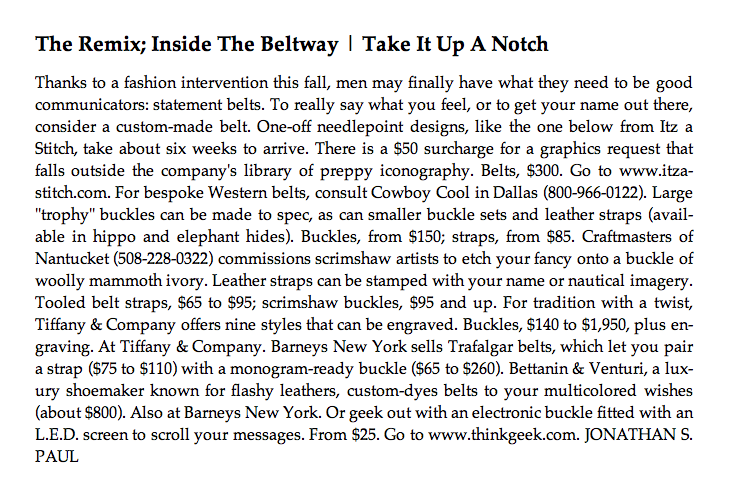 New York Times columnist Johnathan S. Paul featured Itz A Stitch in this 2006 article all about notching up your belts. 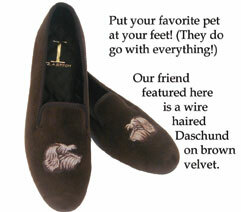 Itz a Stitch has added red, purple and brown velvet to our selection of velvet shoe colors. As with our line of needlepoint, these shoes can be customized with any club logo, monogram, crest or design your own. All velvet uppers are hand embroidrered with metallc, gold filigree or cotton thread. 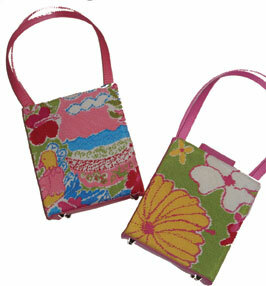 Our summer line of bags went fast! 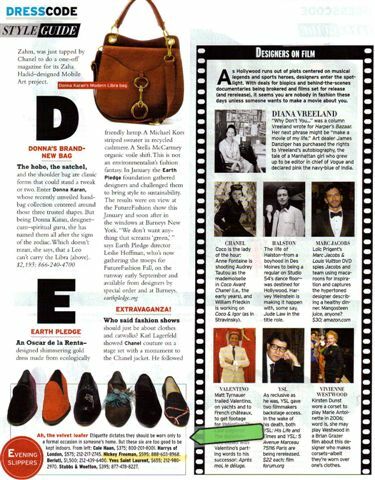 Send us your favorite scarf or design idea and we will create a custom evening bag (in satin) or beach tote (in canvas). Call us for details. If you would like a trunk show to be held in your area, please contact us for more information. Born in Los Alamos, New Mexico, Barbara Story has always had an entrepreneurial spirit. After earning her Bachelors degree in Music History and Literature from the University of New Mexico, Barbara went on to study cuisine at La Varenne in Paris. Upon graduating from culinary school Barbara cooked professionally in Boston and New York. Subsequently she was offered a position at the Bronx Zoo. I was hired to manage the zoos public and private events, but I had such an affinity for marketing, I was given the opportunity to administer different programs within the department. One of these responsibilities was licensing products for the Bronx Zoos Wildlife Conservation Society. It was there that Barbara was exposed to the world of merchandising. Around the same time, Barbara was introduced to her now-husband, the great game of golf and needlepointing. I realized what an ideal client base country clubs have for a unique and high quality product. I wanted to combine my experience in licensing, needlepoint, and my love of golf to create an appropriate range of products for this market. Sandwiched between the birth of her two young children, Barbara founded the company Itz a Stitch in 2001. Before the companys launch, Barbara spent two years extensively researching top-of-the-line manufacturers, and developing her products. Barbara debuted the Itz a Stitch line at the 2002 PGA show in Orlando. Since that time we continue to double sales every quarter.